Producers send me books to evaluate, usually months or even a year before the manuscript hits bookstores. This kind of report is held in the strictest confidence, I’m not even allowed to tell anyone that I’ve seen a particular book. The risk if word got out that a producer is reviewing the material, it could blow their exclusive window. An agency isn’t going to keep that submission exclusive if other producers start calling up and asking for it. In any case, over a year has passed, a studio has bought the rights and the book is published and avail for sale, so I can share my thoughts…. 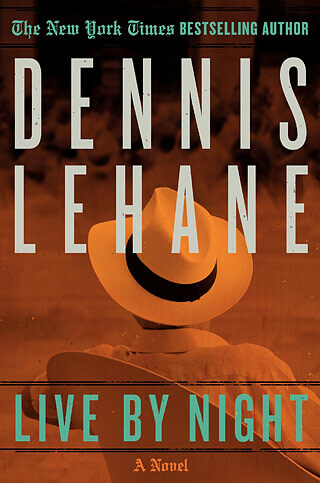 LIVE BY NIGHT is a phenomenal book and based on Lehane’s pedigree (MYSTIC RIVER, SHUTTER ISLAND), his material is a guaranteed studio sale for adaptation these days. I’m glad to see that Ben Affleck is attached to direct this–he did an amazing job adapting GONE BABY GONE, another Dennis Lehane project. LIVE BY NIGHT is a “rise to power” narrative that features a unique 20-something hero. Joe Coughlin becomes a memorable protagonist because he is immensely likable and uses his sharp intelligence to climb the rungs of the criminal underworld without resorting to violence unless absolutely necessary. This is a morality tale that follows Joe as he learns the difference between the youthful fun of being an “outlaw” and the ruthlessness required of a “gangster” to maintain a grip on power. Other favorable elements include two fiery love interests and a clear goal provided to Joe, who aims to destroy the mobster who killed his first love. Drawbacks to the project include a timeframe that spans nearly a decade and the hero’s relative youth in terms of casting potential. We meet JOE COUGHLIN (20) during a casino robbery where he becomes enchanted with a sharp-tongued waitress EMMA who isn’t fazed by the guns and chaos of the situation. After he follows her to a bartending gig, she immediately recognizes his voice and allows him to take her on a date. Their romance becomes hot and heavy, but Joe ignores the fact that Emma is already the mistress to a mobster. Joe’s love for Emma provides the story’s engine as after her presumptive death he swears revenge on the mobster who promised to have her killed. It’s this goal that keeps Joe’s motivation alive during a brutal prison stint. Emma is the first of several memorable supporting characters in the story. As the youngest son of the Boston police department’s deputy superintendent, Joe is an unlikely candidate for a life of crime. His father, JOSEPH SR. states early on that “crime never pays unless you do it on an institutional level” and proves the point with his lavish home and closet full of expensive clothes, not to mention a hidden safe packed with cash from four decades of taking bribes. It’s interesting to note that when Joe is wanted by the police following a bank robbery, he makes a point of leaving his bloody clothes inside that safe—he doesn’t want his father’s cash but wants to make the point that they’re both criminals. Joseph Sr. is placed into an unfathomable situation after Joe is apprehended following a getaway that contributed to the deaths of three cops. Joseph does what he thinks is the right thing and turns his son over to a pack of police officers who beat him to within an inch of his life. A reporter gets the story and Joseph is shamed into becoming his son’s protector again: He uses blackmail to get Joe a reduced prison sentence and will later do a favor for a mobster to keep Joe alive behind bars. But after the mobster gives Joe a name to pass along to his father, Joseph Sr. explains they’re expecting him to kill the suspect in custody and make it look like a suicide. Despite his son’s life hanging in the balance, Joseph Sr. refuses the request. This is the first of several times that the line between “outlaw” and “gangster” comes into play. The difference is that an “outlaw” doesn’t play by the rules while a “gangster” is willing to indiscriminately kill innocents in pursuit of power. The exploration of this idea is at the heart of LIVE BY NIGHT. In most situations, Joe finds that he’s able to use his intelligence to avoid violence. But that isn’t true of those whom he keeps alive as a result of his leniency. And in two cases, he decides to ignore orders to kill honest people who are standing in his way, leading to the destruction of his proposed casino project. As a result, the top mafia bosses to think that he’s too “soft” to run their operation, despite earning them millions of dollars. Joe realizes he’s not meant to work inside of a system where he’s criticized for not operating enough brothels and not beating the girls enough to improve their performance. He likes money and power, but lacks the insatiable greed of others in the profession. The cool thing about Joe is that while he’s reluctant to kill, situations require him to do so on several occasions and he’s fully capable of rising to the challenge. The author does a great job removing the ambiguity from these situations, so Joe is always responding to a direct attack and kills out of necessity. While the story unfolds over the better part of a decade, a movie would undoubtedly focus on the second half of the book where Joe builds his rum empire with the help of Cuban revolutionaries. In order to gain a monopoly on the molasses imported from Cuba, Joe works with them to stage a daring attack on a Navy ship in order to steal weapons that can be used to overthrow the newly installed Cuban government. It’s during this period that he meets the love of his life, GRACIELLA. Together, they become millionaires and share a desire to engage in philanthropy—After he’s shot and spends months recovering, Joe gives the hospital a quarter of his yearly income and still manages to build a library, a school, and a free clinic for Cuban immigrants. LIVE BY NIGHT has all of the elements of a “mafia movie” but manages to tell a fresh story by moving the action to sunny Florida and focusing on characters who fall far outside the Italian stereotypes that usually populate these films—here, the hero is an Irish Catholic who falls in love with a half-black/half-Latin Cuban revolutionary. And in terms of excitement, there is a great deal of non-gratuitous violence that adds frequent tension to the narrative—The hero alone is shot twice and stabbed twice at different points in the story. Next2012 Blacklist Scripts Plus Straw Dogs 2011 Analysis! James Cameron’s THE INFORMATIONIST was bound to become a franchise film!